By 2020, more than 20 billion connected things will be in use worldwide across consumer and business segments. This is an estimated 2.6 smart connections for every person on the planet! Clearly, the Internet of Things (IoT) is going to be an important business driver for the next few years. Its impact on food traceability will be instrumental in addressing everything from world hunger to improving food safety. In laymen’s terms, IoT refers to any object that can connect to the internet. And by object, this could mean things as diverse as clothes, water meters, fitness devices, mobile phones, and even food packaging. Even though people have become familiar with the concept of being connected, IoT takes it to an entirely different level. IoT provides organisations, irrespective of industry, with the means to capture data covering a broader range of fields than previously possible. In turn, this requires the data to be managed and converted to insights that can result in improved service delivery, product development, and other competitive advantages. Of course, managing the massive influx of data generated by these devices requires solutions that are flexible and customisable to organisational requirements. This is where enterprise resource planning (ERP) systems come in. Many might baulk at the thought of ERP being considered flexible, but today’s systems are far more nimble and user-friendly than the behemoths of the past. Modern ERP vendors cannot rely on complex proprietary code with a closed architecture. They need to be open for business and ready to interact with any device irrespective its location. Considering the impact this will have on businesses that embrace this philosophy, having a platform that offers real-time IoT data analysis and business intelligence will drive a lot of innovation and efficiency across the supply chain. Consider a typical production shift of eight hours. If the machines in a food plant is inefficient by just two seconds and, considering that each cycle time only last a few seconds, this can add up to losses of a full eight hour shift per week if not more. Being able to read the real-time machine information into production planning through IoT and ERP systems, a food processor can significantly drive efficiency. The same can be said on the volume of data. Understanding what is really going on across all your machines, across all the plants, across any location is no longer a nice to have in this competitive environment. Then factor in components such as moisture content, viscosity, volume, and so on, then the business will really be able to embrace true traceability. 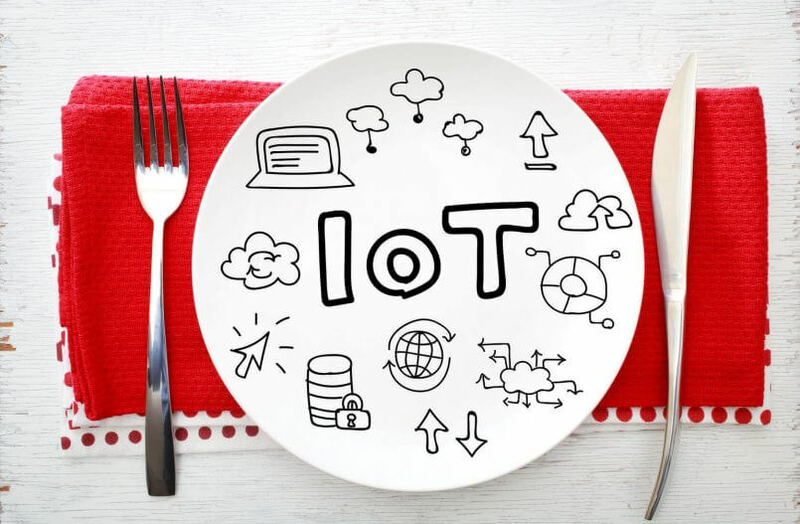 It might sound trite, but combining IoT, ERP, and effective data management has the potential to solve significant global issues such as world hunger. By optimising processes, crop yields can be improved. Furthermore, by using IoT devices in equipment, farmers can receive better insights on soil volatility as well identify the best methods for harvesting and storing produce. As for the rest of the supply chain, being able to work out the best routes for collection and delivery, and even reducing wastage by ensuring the right stock levels are distributed to retail outlets. But without even a willingness to embrace IoT and ERP-driven systems, the food sector is destined for failure. The signs are clear, change is inevitable and IoT will bring traceability to a more integrated level.